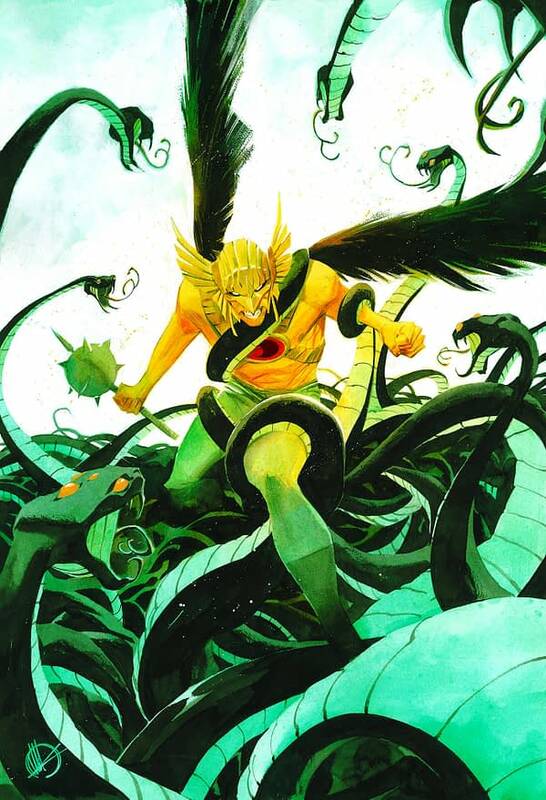 Back during San Diego Comic Con, Robert Venditti indicated that Hawkman‘s current run would reveal his ancient origins, including a Kryptonian version of Katar Hol. Today, during the New York Comic Con “DC Nation” panel, Venditti confirmed that we will be meeting the Kryptonian version of Katar Hol in Hawkman #8 which will be out this January. Venditti is writing Hawkman with art by Bryan Hitch. He sees the character as the Indiana Jones of the DCU. DC Metal recently revealed the character has been alive for 10,000 years, far more than what was previously believed based on his Ancient Egyptian origins, and that he reincarnates across time and space. Even the Silver Age cop, Katar Hol, was just a single persona. Venditti wants to explore “the mystery of his lifetimes” because the character cannot remember anything from his past lives but did leave clues that only he would comprehend. Venditti wants to “give it up for hairy chests.” Fans will see a Rannian Hawkman, with a jetpack, as well as a Kryptonian one. Venditti didn’t reveal anything else about the Kryptonian Hawkman, so we’ll just have to wait until January’s Hawkman #8 to find out.